"I'm a goddamned artist too!" 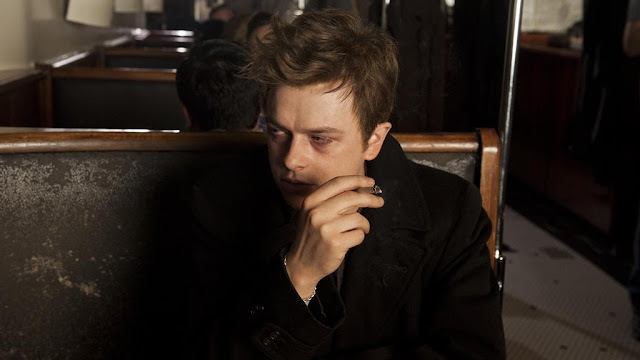 Photographer turned filmmaker Anton Corbijn dramatizes the 1955 Hollywood scene with Dane DeHaan starring as enigmatic actor James Dean opposite photojournalist Dennis Stock played by Robert Pattinson. Life, titled after the magazine and inspired by the duo's famous Moody New Star photo essay, is an exploration of 1950s studio system contrasted with the New York art crowd through the lens of two opposed but burgeoning artists on the precipice of change. Stock is our audience cypher who meets Dean and is immediately attracted to his understated yet obvious star qualities. Taking place after Dean shot East of Eden and before filmming Rebel Without a Cause, Life looks to both recreate and further mythologize the legend of the evasive but talented young actor taken before his prime. DeHaan gives a very light, playful performance getting across Dean's intellectual charm and curiousity. He really manages to capture all his awkwardness and contempt for his rising fame and the star system soon to be out of fashion. His portrayal benefits from subverting our collective awareness of the famous star and his cult of personality contrasted with Pattison's largely thankless role of our entry point into the mostly surface-level film. Constructed as a moody drama, author Luke Davies' script is detailed but lacking in much of any substance beyond the iconic nature of its real-life story. Life is ultimately about artists set against the changing Hollywood system as Corbijn's restrained directorial hand and camera captures the essence of the actors in their setting. As the film gets across, the times really were changing. Life screens at the Rio Theatre this week.